AS I sat at one of the few laminated indoor tables in Kefi I overhead a suited man proclaiming to the cashier that they made the best gyros in Australia. That’s a pretty big call but probably well substantiated considering the chef behind (or in front of) the spits full of rotating meats at Kefi Souvlaki & Pizza Bar at Kingsgrove is one David Tsirekas (formerly of Sydney Greek restaurants Perama and Xanthi). I’m unsure what gyros the suited man had just eaten as Kefi’s menu is extensive (and despite also being a “Pizza Bar” there is no pizza in sight). The proof would lie in the tasting of the pork gyros ($8) I was waiting for – would it be as good as those “yiros” I ate at 2am during my university days some 25 years ago? My pork gyros was wrapped as if was done by expert gift wrapper. Inside the soft and warm pita were slices of smoky pork with slices of onion and tomato, chopped parsley drizzled with garlicky tzatziki and mustard mayo. Spikes of golden, crunchy potato chips towered at the end. Chips (WTF)? Not that it was an offensive addition but I never had chips (or even saw chips), in those 2am lamb yiros back in North Adelaide. It was good. It was clean. It was far more sophisticated than something experienced on the way home after a night out on the Cooper’s ale in the ’80s. Most of all it felt as if this was how a gyros (yiros) was to be. I told my colleague Heracles that I went to Kefi and had a gyros. The first thing he asked me was if it had chips in it because that was essential. 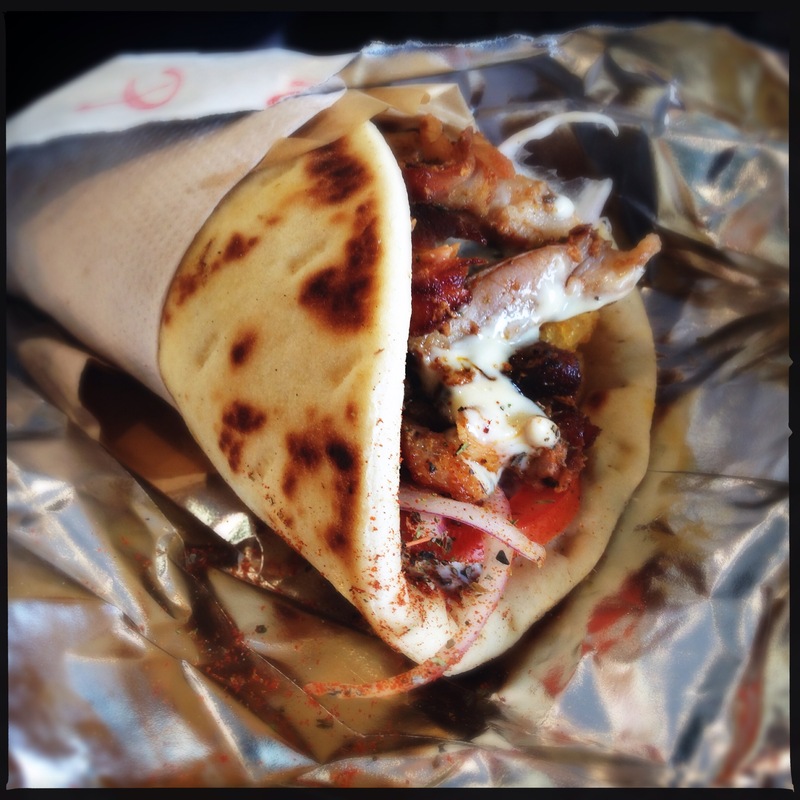 His comment hit me like a lightning bolt from Zeus – it seems that those 2am yiros laden with dripping fat and garlic sauce which would meld and ooze out the bottom of the pita and drip down your arm and make your breath smell like you had just eaten a garden full of garlic and onion weren’t authentic after all. 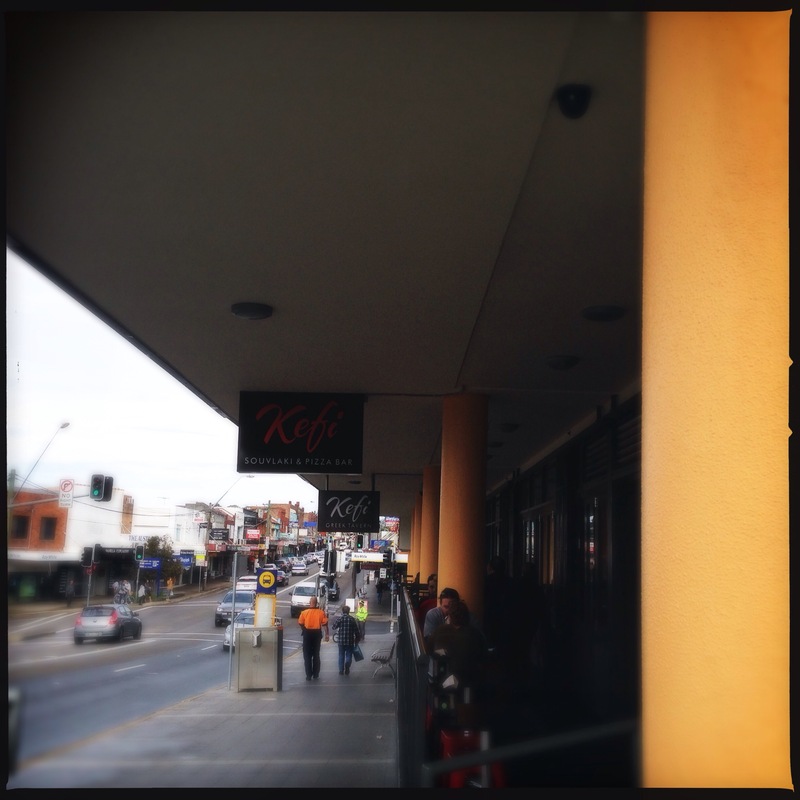 Kefi’s “souvlaki bar” is next to the more upmarket Kefi Greek Tavern restaurant on Kingsgrove Road and is literally a one-minute walk from the Kingsgrove railway station. With seating for eight inside and 12 on its veranda Kefi is a temple to Greek street food (but with a twist). There’s the traditional fare but what is exciting about Kefi and caused me to come back on four separate occasions was the “bling” that they add to gyros. While devouring that pork gyro one particular gyro caught my attention on the menu board – the pork belly baklava gyro ($9.50). This sounded far more exotic than the “yiros” from North Adelaide’s Blue and White Cafe (the Blue and White yiros was considered a rite of passage back then as was its AB – an Adelaide icon. You can read about the AB here). I had to have it so I travelled back to Kefi the following day. 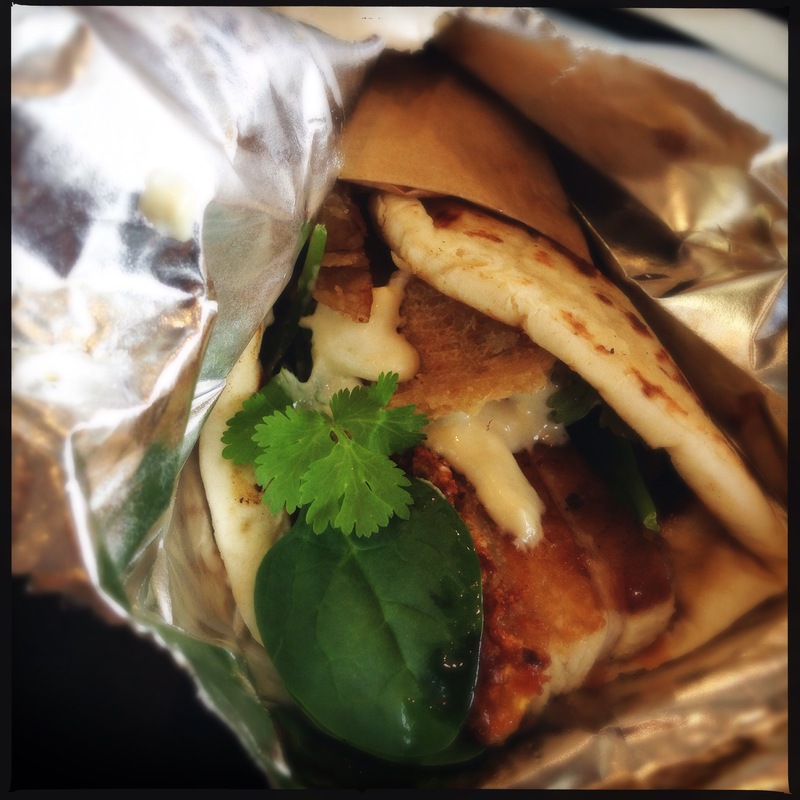 The pork belly baklava gyro was excellent. Again, the pita was soft but in it was a combination of sheer genius: slices of thick and succulent slow-roasted pork belly, smashed/de-constructed baklava (date and pistachio paste as well as shards of filo pastry), and instead of crunchy chips it had crunchy pork crackling. An “apple mastic” mayo brought some sweetish tartness and acidity to cut through the glorious fat of the pig bits and sweetness of the baklava paste and the parsley, coriander, mint and watercress salad was ideal as it added some freshness. The entire combination put me in a happy place. The menu had some interesting gyros combinations. There is a prawn saganaki ($12) with grilled prawns, red peppers, gets parsley drizzled with saganaki sauce (which I guess is a saganaki cheese based sauce); the calamari ($10.50) with grilled calamari, lettuce, tomato, cucumber, onion and an ouzo mayonnaise; and the soft-shell crab ($9.50) with deep-fried soft shell crab, a ‘Greekslaw’ of purple cabbage, green apple, carrots and herbs, coriander and a mustard mayo. The excitement over Kefi’s gyros got me thinking – how would its lamb one compare with the distant memories of those I had back in the 80s? Back then a lamb “yiros” was packed full of lettuce, onion, tomato, parsley and tzatziki sauce – the Aussie late night favourite used to lessen the impact of the anticipated hangover you may experience later. So I had a lamb gyros ($8.80) on my latest visit and it was one of the best – it even out did the pork and pork-belly gyros I had on my earlier visits. The soft pita was filled with slices of mouth-melting and flavoursome seasoned lamb with slices of onion and tomato, chopped parsley and crunchy chips all drizzled with garlicky tzatziki and mustard mayo. It was superb and best of all not a drip of sauce or fat ran down my arm. The verdict: The humble street Gyros has been given some mature flair and sophistication by David Tsirekas. Go trad or gourmet with some bling. This entry was posted in Greek, New South Wales, Street Food, Sydney and tagged Australia, Greek, Gyros, Kefi, Kingsgrove, Sydney, yiros. Bookmark the permalink.